This building is one of the oldest in the city. The con­struction of the Twelve Collegiums building was started after Domenico Trezzini’s project in 1722. The construc­tion was finished only in 1742 by Mikhail Zemtsov. The building is divided into twelve identical but in­dependent sections. Each of the twelve parts of the building has its separate roof. 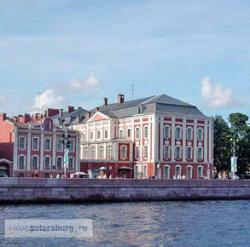 One end of the building faces the Neva, the main facade stretches for nearly half a kilometre into the island. Important administrative reforms by Peter I were put into effect at that time. The numerous state establish­ments (prikazy) were replaced in 1718 by “collegiums” set up by Peter the Great. They had to replace more than forty departments which were involved in the ruling of the country and did it with no effect. The colleges were committed in the direction of certain- branches of economy and state services. At the begin­ning of the 19th century they were reorganized into ministries. In 1819, the building erected by Trezzini was taken over by St Petersburg University. Many Russian scholars have made this educational institute famous. From 1866 to 1890 the outstanding Russian chemist, Dmitry Mendeleyev (1834-1907), lived and worked at the university. Mendeleyev is famous for having for­mulated the Periodic Law and invented the periodic table of elements. Nowadays, the apartment in the university where he lived for nearly twenty-five years is a museum. It’s open to the public. The sections of the museum are devoted to Mendeleyev’s childhood, stu­dent years and his early scientific work. The history of the discovery of the Periodic Law of elements figures in the exposition. Instruments from Mendeleyev’s labora­tory are on display here. They are a barometer and a two-tiered balance for weighing solid and gaseous sub­stances actually designed by Mendeleyev. Many prominent scientists and writers worked here, among them the naturalist Ivan Sechenov, Alexander Popov, inventor of the radio, and the writers Nikolay Chernyshevsky, Ivan Turgenev and Nikolay Nekrasov. Nowadays, over 17,000 students are enrolled in its departments.